The highpoints of the fifty states range from Alaska’s 20,320 foot high Mount McKinley to 345 feet at Lakewood Park in Florida. Some highpoints, such as Mount Mitchell in North Carolina and New Hampshire’s Mount Washington can be reached by automobile on a sightseeing drive. Others such as Colorado’s Mount Elbert or Mount Marcy in New York are accessible as wilderness day hikes. Still others, such as Mount Rainier in Washington or Gannett Peak in Wyoming, are strenuous and risky mountaineering challenges that should be attempted only by experienced climbers. Whatever your level of skill and interest, Highpoints of the United States offers a diverse range of experiences. Arranged alphabetically by state, each listing has a map, photographs, and information on trailhead, main and alternative routes, elevation gain, and conditions. Historical and natural history notes are also included, as are suggestions for specific guidebooks to a region or climb. Appendices include a list of highpoints by region, by elevation, and a personal log for the unashamed "peak-bagger." 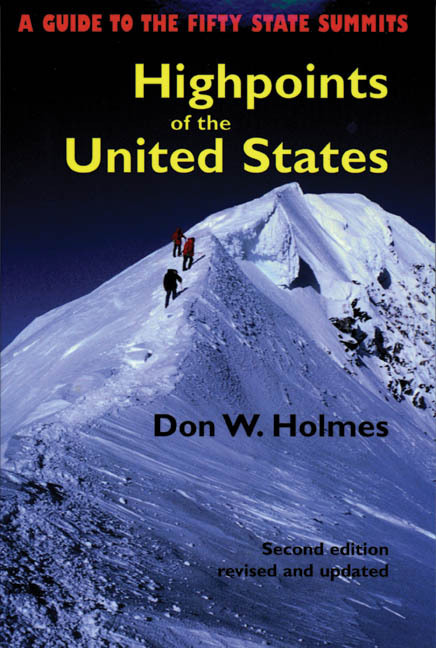 Whether you’re an armchair hiker or a seasoned climber, interested only in your state’s highest point or all fifty, this book will be an invaluable companion and reference. Don W. Holmes is a native Californian who learned to love the outdoors on camping trips as a boy. A charter member of the Highpointers Club, he climbed Mt. McKinley in 1983.